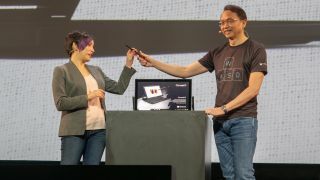 Acer brought a serious suite of new tools for 'prosumers', with laptops, desktops and monitors geared for professional use, to its annual Next@Acer event in New York City. The new line is called ConceptD and includes even a VR headset designed for digital engineers. The ConceptD 9 is the series's premier mobile workstation. The laptop has a 17.3-inch, 4K UHD display built on a hinge that allows it to flip, rotate and extend in a way similar to the Microsoft Surface Studio. Powering the whole experience is up to a 9th-gen Intel Core i9 processor and Nvidia GeForce RTX 2080 graphics, all cooled by Acer's 4th-Gen Aeroblade 3D fans to keep the system cool and noise below 40dB.